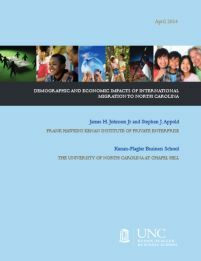 A new study released Tuesday by the North Carolina Bankers Association (NCBA) shows the profound economic impact immigrants have had on North Carolina’s economy. Hispanic buying power ($9.5 billion) rippled through the state’s economy creating an overall economic impact of $10.3 billion, or $12,895 per Hispanic resident, in 2010. Hispanic consumer spending was responsible for creating 92,000 spin-off jobs which, in turn, generated $3.4 billion in spin-off labor income, $460 million in spin-off state and local taxes, $444 million in spin-off federal taxes, and $367 million in spin-off social insurance payments. Consumer spending by all immigrants generated 171,000 spin-off jobs, $6.4 billion in spin-off labor income, $1.4 billion in spin-off state and local taxes, $863 million in spin-off federal taxes, and $693 million in spin-off social insurance payments. The state received $2.4 billion and $1.5 billion, respectively, in total tax revenue (direct and indirect contributions) from immigrants ($3,869 per capita) and Hispanics ($1,900 per capita) in 2010. $8 in revenue was generated for every $1 the state invested in essential services for immigrants; $5 was generated for every $1 invested in essential services for Hispanics. The report’s bottom line: The overall economic impact of immigrants and Hispanics has been positive for the state, and underscores the need for an open door immigration policy. It seems there is only one problem with this article. Immigrants are taking many of the jobs(construction,landscaping,etc.) that would have gone to unemployed North Carolinians who would have produced the same economic results if they were working. There’s only one problem with your argument, these jobs are seldom filled by “unemployed North Carolinians”, or any state for that matter. A perfect example of this in action is Alabama, where immigrant workers were forced out, and nobody picked up the jobs they left behind, particularly in agriculture. So, no…it wouldn’t have the same economic effect. It would probably be different here, you know now that we have started the process of getting more people off the government perks. See Alan/ML, your comment actually plays against the global liberal hysteria out there. The folks on the government dole have little incentive to take a job if they are getting paid (most likely a similar amount) by the government. Until the opportunity cost of getting the job outweighs the perks you have people staying home until it is “worth it” to go out and be a productive taxpayer.